Like the rest of Rhea's surface, the southern polar region of this Saturn moon has been extensively re-worked by cratering over the eons. This close-up shows that most sizeable craters have smaller, younger impact sites within them. Near the left lies an intriguing gash. 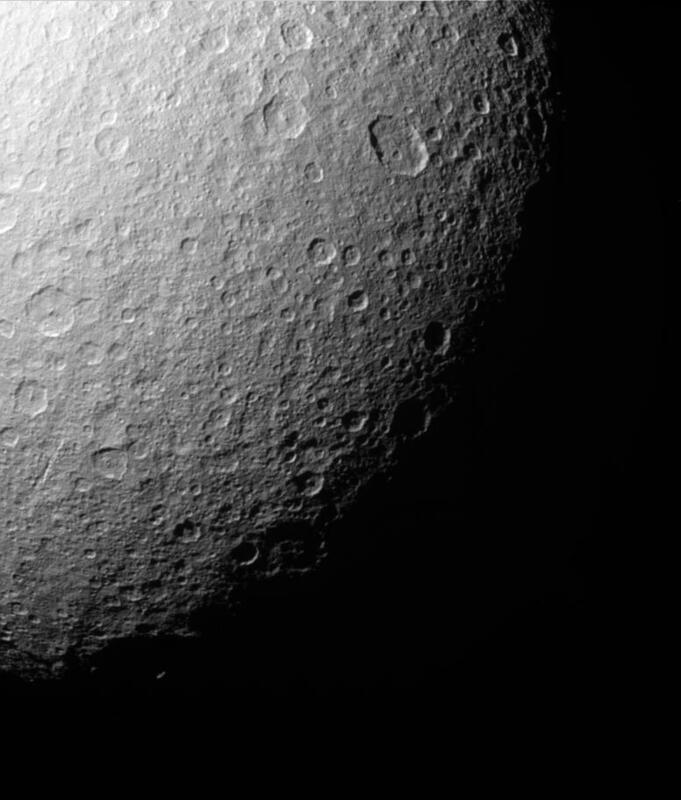 Cassini acquired this view during a distant flyby of Rhea (1,528 kilometers, or 949 miles across) on July 14, 2005. The image was taken in visible light with the Cassini spacecraft narrow-angle camera at a distance of approximately 239,000 kilometers (149,000 miles) from Rhea and at a Sun-Rhea-spacecraft, or phase, angle of 56 degrees. The image was obtained using a filter sensitive to wavelengths of infrared light centered at 930 nanometers. The image scale is about 1 kilometer (0.6 miles) per pixel.